Scope and Content Interior of Recreation Hall, Craig Dunain Hospital, Leachkin Road, Inverness, Highland (now closed) This splendid hall, built in 1927, has a barrel-vaulted ceiling, with the vaults arising from tall pilasters arranged along the sides of the room. Long bipartite windows, set between the pilasters, flood the interior with natural light. The hall was originally designed as a cinema auditorium with seating accommodation for 400 patients, staff, and their friends and families. The large, circular shafts in the ceiling were essential for ventilation, and the two small 'windows' high on the wall above the door (centre) were projection ports through which the film was projected onto a screen at the opposite end of the hall. 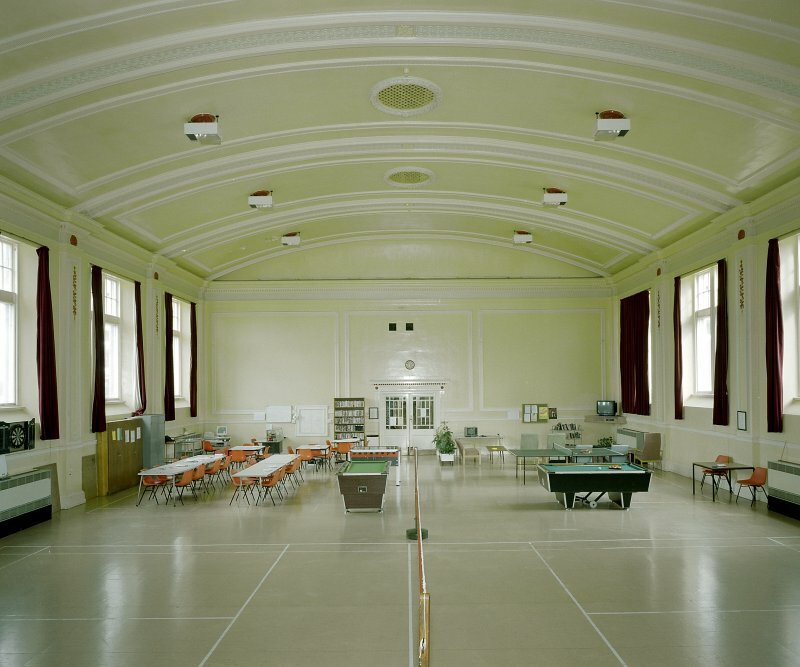 A large recreation hall was a feature of all asylums, and provided a room where staff and patients could meet together on an informal basis. The hall was often very elaborate and spacious, attempting to recreate the atmosphere of a grand hotel or country house. Here the patient had the opportunity to engage in a series of quiet pastimes such as reading, drawing or writing as well as a range of indoor sports, or take part in amateur theatricals or musical evenings. The hall hosted weekly balls, concerts, recitations and lectures as well as a Christmas dinner and dance. Craig Dunain was one of the first asylums in Scotland to have a hall equipped for use as a cinema. It showed weekly picture shows which, when the cinema opened, were 'silent' films with titles on the screen to explain the story. A pianist accompanied the film with the right type of music - for example, fast and furious music during a chase scene. 1927 was also the year when the first full-length 'talkie' (film with sound) was shown. Craig Dunain Hospital, designed by the Aberdeen architect, James Matthews (1808-98), opened in 1864 as the Northern Counties District Lunatic Asylum with accommodation for 250-300 patients in single rooms. It was the third District Asylum to be built in Scotland, and occupies a splendid hillside site above Inverness. Additions were made in 1898-1901 to include male and female wards, and further expansion in the 1920s saw the construction of a recreation hall. The last major building scheme before the hospital closed in 2000 included the construction of a new chapel which was completed in 1963. Source: RCAHMS contribution to SCRAN.